Back in the '70's and '80's, when I worked night shift in the Emergency Department at Glendale Memorial Hospital and Health Center, a frequent early morning, send out for food place was the Beef Bowl. It was just a few blocks up Brand Blvd. on Colorado Blvd. It was quick, it was convenient, it was close to work and the food tasted great. At the time it seemed to be a nice, clean and friendly fast food place with an oriental flair. I wasn't aware of any others in the area and in all my travels, I hadn't come across a Beef Bowl since. On many occasions when I was searching for something a bit different to eat, I wished I could have discovered a Beef Bowl although I must confess that most of the time I had the Chicken Bowl. A day or two ago I was reading the newspaper (Read in 2004, ban initiated in December 2003, actually. Limited beef trade restarted December 2005.) and the article was about the expected crunch at Japan's very popular Yoshinoya restaurant chain. With American beef banned because of the mad cow disease scare, one of Japan's most popular lunch time traditions was about to be severly altered. Alternate sources of beef are unsuitable - native beef is too expensive and Australian beef is thought not to taste the same. When existing stocks of imported American beef are depleted, it is thought the beef bowl will be dropped from the menu. Popular nation-wide, Gyu-don restaurants such as Yoshinoya, Matsuya and Sukiya, serve the Sukiyaki-like beef and rice in a bowl, renown as a cheap and quick menu fare, for students and businessmen in an otherwise expensive food nation,. There are three sizes in Gyu-Don:"Nami", the standard size,"Oh-mori", a big size, and "Toku-mori" an especially big bowl. You just sit in front of a table and order the size of Gyu-don you wish You can order more side menu items like miso-soup, pickles, raw egg, salads and so on. In Japan, water or green tea to supplement your budget meal are free at Japanese restaurants. You can order Gyu-don to go as a take out meal. Beef Bowl - Thin juicy slices of USDA choice beef simmered with fresh onions in a special sauce of herbs and spices, heaped on a bed of steaming, fluffy rice. Beef Bowl with Vegetables - A beef bowl with an added helping of mixed vegetables including carrots, cabbage, broccoli and cauliflower. Teriyaki Chicken Bowl - in regular and spicy chicken versions: Tender, golden-brown slices of chicken topped with a proprietary teriyaki sauce and a variety of vegetables and smothered over a bed of plump, steaming white rice. Vegetable Bowl - A sumptuous bowl-full of grade A mixed vegetables including carrots, cabbage, broccoli and cauliflower. Breaded Shrimp Bowl - Large, plump shrimp or fish, fresh vegetables, battered and cooked with cholesterol-free oil, served with a bed of steaming white rice. 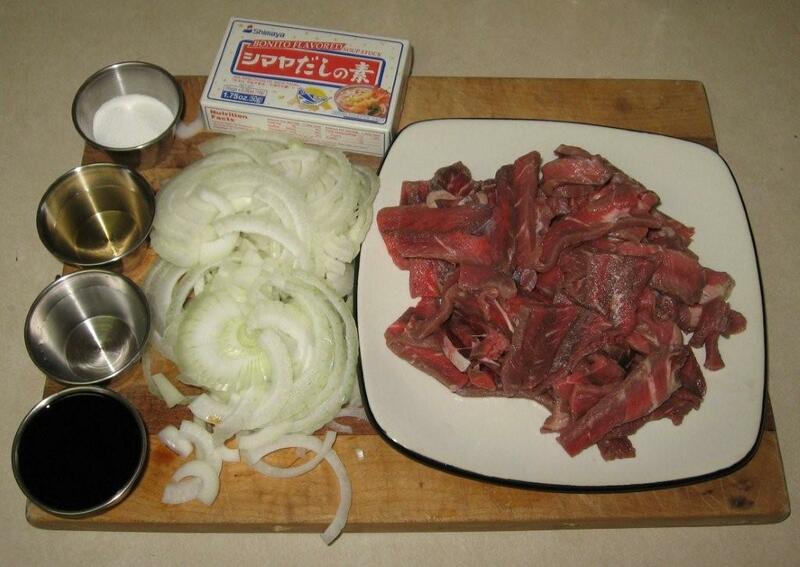 To make a Beef Bowl, Gyu-don, at home, try the following (it's not exactly the same as the Beef Bowl but close and it will whet your appetite for when you find the real thing). 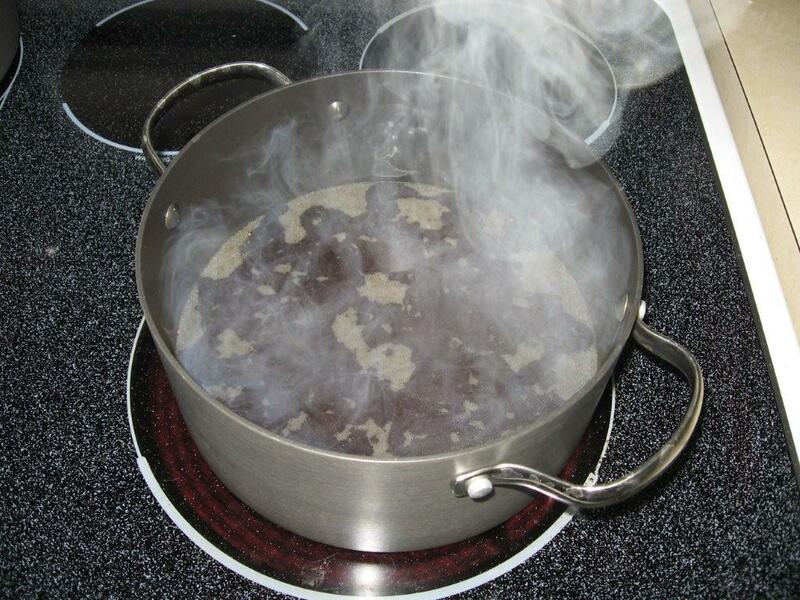 In a saucepan, place together dashi, soy sauce, sugar, mirin and sake and bring to a boil. 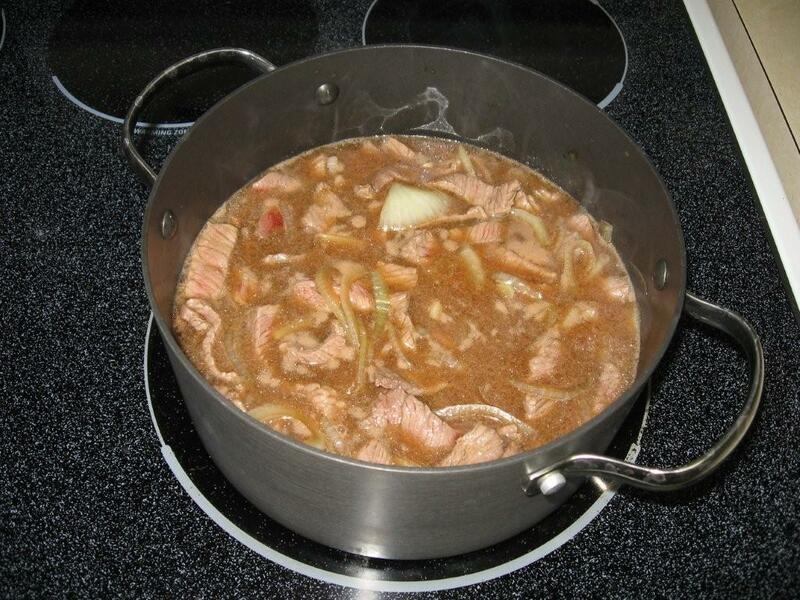 Add beef and onion to the saucepan and cook for 5 minutes over medium heat. Skim off carefully. Cook just until beef is no longer pink - overcooking makes the beef tough. Optional Step: Add cornstarch slurry and cook while stirring to thicken sauce. Serve on cooked rice. The plain Beef Bowl is served with a small container of red ginger beni-shoga on the side as a condiment. 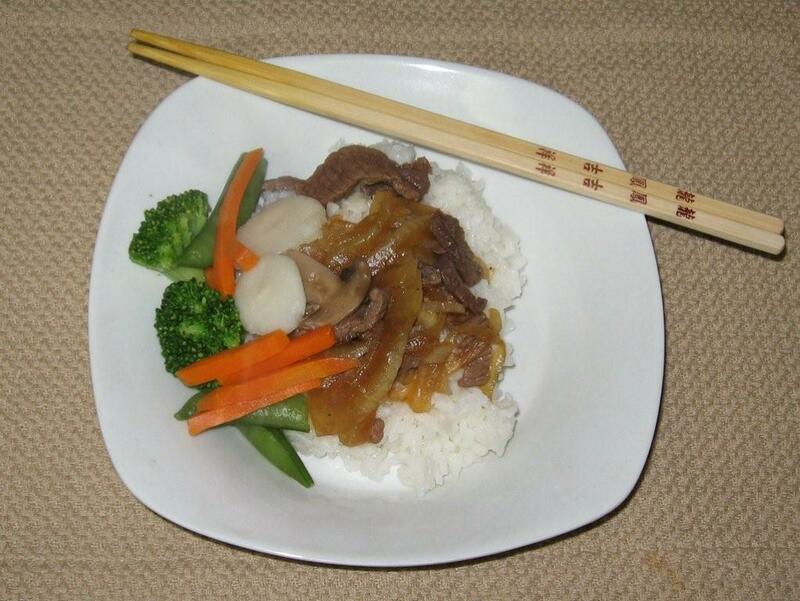 The combination beef bowl features steamed vegetables. As I remember the Beef Bowl,flank or skirt steak would work well for this dish. Don't be hasty when trimming any fat from the meat. Ichiban dashi - first brewed for clear or noodle soup (If eaten as a clear soup, season with a bit of soy sauce and sea salt and garnish with sliced scallions. Dried mushrooms often are found in dashi soup. Niban dashi - second brewed for general use. Konbu dashi - for making nabemono and tofu. Nibashi dashi - for making miso soup. Mirin - A low-alcohol, sweet, golden wine made from glutinous rice. Essential to the Japanese cook, mirin adds sweetness and flavor to a variety of dishes, sauces and glazes. It's available in all Japanese markets and the gourmet section of some supermarkets. Mirin is also referred to simply as rice wine. Sake - This Japanese wine, the national alcoholic drink of Japan, is traditionally served warm in small porcelain cups. The yellowish, slightly sweet sake is made from fermented rice and doesn't require aging. It has a relatively low alcohol content of 12 to 16 percent. Sake is used in Japanese cooking, particularly in sauces and marinades. Once opened, it will keep tightly sealed in the refrigerator for at least 3 weeks. Beni shoga - Gingerroot that's been pickled in sweet vinegar and colored bright red. Beni shoga is used as a garnish for many Japanese dishes, especially sushi, and is also eaten to refresh the palate. It's available in thin slices, shredded or in knobs and can be found in Asian markets. Beni shoga is also called gari.